Human Gene Therapy is a rapid-publication peer-reviewed journal covering all aspects of human gene therapy. Publishes scientific papers on original investigations into the transfer and expression of genes in mammals, including humans. Improvements in vector development, delivery systems, and animal models, particularly in the areas of cancer, heart disease, viral disease, genetic disease, and neurological disease, are covered. Includes ethical/legal/regulatory papers related directly to the area of gene transfer into humans. 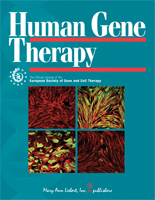 Login or create an account to view the latest articles in Human Gene Therapy.